Miracle Chalk Pounce Powder. 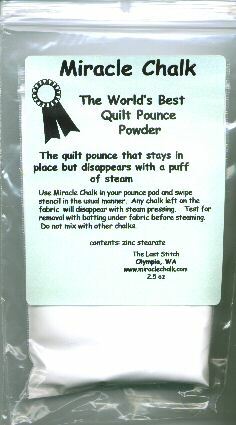 The quilt pounce powder that stays in place when you need it but disappears with a puff of steam. 2.0 ounces. Recommended for use in the pounce pad (sold separately or in the Miracle Marking Kit). NOTE: Always test EVERY product you use on a "sample swatch" of each and every exact fabric you are using in your project before you proceed to marking the entire project. 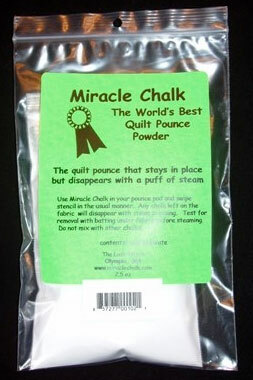 Miracle Chalk has been reported to not work well on sateen type fabrics as well as some batiks.